China's Wanxiang Group had the winning bid for A123 systems. Chinese auto parts maker Wanxiang Group has prevailed in a court-sanctioned bidding war for the assets of lithium battery maker A123 Systems, a one-time darling of the U.S. electric car industry. A123 said the closing price was $256.6 million, and includes the company's automotive, grid and commercial business assets, as well as a manufacturing facility in China. Wanxiang's Chicago-based subsidiary, Wanxiang America, was named as the purchaser. The company has more than 3,000 employees in the U.S., but the purchase is bound to draw scrutiny as the latest in a series of tech and energy acquisitions by bargain-hunting Chinese firms. In an attempt to head off political opposition, A123 has agreed to sell its business with the U.S. military to Illinois-based Navitas Systems for $2.25 million. A123 was a major supplier to the U.S. electric car industry and recipient of $249 million in government stimulus funding. Before failing, the company drew down much of the government loan. 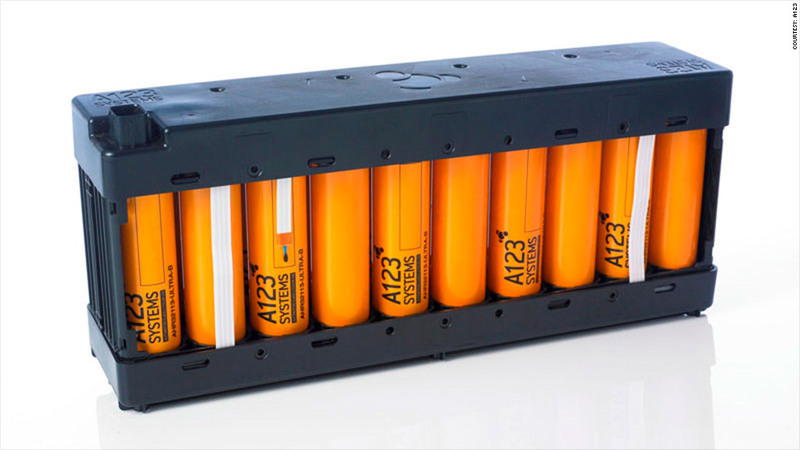 A123 (AONEQ) first announced in October that it had filed for bankruptcy. The same day, the company said it had entered into a $125 million deal for the sale of its automotive assets to Johnson Controls. As part of the deal, Johnson Controls (JCI) agreed to provide A123 the funding it needed to operate during bankruptcy reorganization. But Wanxiang went to federal bankruptcy court in Delaware, arguing it had a better offer for A123 already on the table, and seeking to be the one to provide bankruptcy financing to A123. Johnson Controls announced Sunday that it was withdrawing its bid for A123. "While A123's automotive and government assets were complementary to Johnson Controls' portfolio and aligned with our long-term goals, Wanxiang's offer was beyond the value of those assets to Johnson Controls," said Alex Molinaroli, president of Johnson Controls' power solutions unit. According to Johnson Controls' statement, the Wanxiang purchase of A123 will now be considered at a bankruptcy court hearing currently scheduled for Tuesday. The sale to Wanxiang is also subject to review by the Committee for Foreign Investment in the United States, a government body that includes the secretaries of Treasury, Homeland Security, Defense, State, Commerce and Energy, as well as the Attorney General, and considers the national security implications of such investments. Wanxiang had previously agreed to pay $465 million for a controlling stake in A123, but the deal ran into government opposition due to the investment in the company by the Energy Department and the company's contracts with the U.S. Defense Department. A123 says the separate deal with Navitas Systems provides a solution to that problem. "We think we have structured this transaction to address potential national security concerns expressed during the review of our previous investment agreement with Wanxiang announced in August as well as to address concerns raised by the Department of Energy," A123 CEO Dave Vieau said in a statement. Regulators in the United States, including the Committee on Foreign Investment, must still approve the deal. -- CNNMoney's Chris Isidore contributed reporting from New York.